Last week The Guardian Newspaper reported that following a two-year battle, female British Airways cabin crew had won the right to wear trousers. Later in the week a young girl from a school in Dublin was interviewed on Newstalk Lunchtime about petitioning her school to allow girls wear their tracksuits every day should they wish to. Both stories made me smile. Uniforms are a great idea. Especially if they are good quality and look smart and are appropriate to the job in hand. 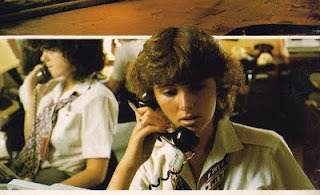 I wore a uniform in my first job which was working for, what was then Ireland’s largest tour operator, JWT – ask your ma, this was back in the early ‘80s. Our uniform was a grey A line skirt, sharp white shirt (although mine generally lacked sharpness prompting regular enquiries as to whether my iron was broken), a red, white and navy scarf and a navy blazer. Footwear was a matter for ourselves but it was generally agreed that navy court shoes were the way to go. Again it took me a while to get into wearing what I considered to be ‘mammy shoes’ and so for my first summer as a sales clerk I wore white clogs, yes the Dutch version – wooden and leather. Again – ask your Ma – they were all the rage in the early ‘80s. In fact, there was an actual clog shop on South King Street if my memory serves me correctly. But I digress. Every so often the company (JWT, whose tag line was ‘join the JWT set’) got a bit anxious about the fact that being a very young workforce we socialised a lot and on occasion (read ‘very often’) ended up in the basement nightclubs of Leeson Street with uniforms looking slightly the worse for wear. Yes, I know, I am a little ashamed now (no I am actually not). My being six feet tall seemed to be a much bigger deal way back then (you all seem to have gotten taller since) and meant that when we went to get measured every year for our skirts, my order had a note attached which said ‘add three inches to skirt’. Knees were kept out of sight – which in my case was a very good thing, they’re a long way from being my best feature. Most of the time I wore my uniform with pride and pretended I looked as good as the Aer Lingus girls who back in those days were only seen at the Airport and on board flights, as they were transported to and from work by minibus, ensuring they were never spotted in Leeson Street dens with uniforms akimbo. They also got regulation shoes, ensuring no clogs could spoil their lovely designer outfits. Winter was very sartorially challenging, particularly when one had no company minibus to get to work. The JWT set were reliant on shanks mare, bus or in my case the train. Yes, the train – the DART was not yet a twinkle in CIE’s eye! Standing on the platform by the sea in Seapoint on a bitter winter morning with bare legs would bring a tear to a glass eye. I mentioned my height already and hence tights were not an option as I never got comfortable with the gusset swinging down around my knees. But winters could be somewhat circumvented by availing of Joe Walsh’s (he of JWT – clever isn’t it?) crafty cost saving plan. In those days people generally only went on Summer holidays which they booked in January which was mad busy. But us sales people had very little to do in October, November and December, so Joe offered us ‘winter leave’. We could take off for up to three months unpaid and most of us who availed of this headed south to the Canary Islands where we picked up some ad hoc rep work to keep body and soul together while we holidayed and partied the winter away. It was on one such winter leave that I fell in love with a pair of Spanish, thigh high, bright red, soft leather boots. I thought they were made for me. No heels, but long enough to go over my knee and so with my extra inches added skirt, my legs would be sheltered from the worst excesses of an Irish winter and sure weren’t they red – one of the uniform colours. I parted with my cash and brought them home. Their inaugural outing was on my first day back to work in early January. As the train chugged its way towards Pearse Station I admired my legs. As I glided out of the train with hundreds of other morning commuters I noticed that the station had added a ramp where the stairs used to be. So off I set, head held high, convinced that every young fella must be admiring my red boots, my winter tan and my statuesque height. I probably flicked my hair too. The ramp was wet and my boots were brand new. Yep, you guessed it. Feet went from under me and down I went, landing very ungracefully on my arse in the middle of Pearse Street Station. Various people came to my aid and I muttered “no I am fine, thank you, I am fine, no damage” and tried to reassemble myself and retrieve some of my shattered pride. To make matters worse I then had to endure the walk to Baggot Street with most of the commuters who had witnessed my fall from grace. I was also terrified that I would slip again. The boots were lethal. The journey took ages. I had somewhat recovered my composure by the time I arrived at JWT HQ. On the safer surface of carpet tiles, I once again flicked my hair as I entered the office, one red booted foot after the other. And sure enough I was greeted with comments like “Wow, some boots”, “Great boots, Scully” although the remarks lacked envy or admiration and carried a hint of mirth. Then my boss came out of his office. In those days it was OK for a man (boss or not) to pass remarks on a female colleague’s appearance. “They are not appropriate with the uniform. Don’t let me see them again.” All in all, it was a dark day. So my tan faded and I went back to having legs purple with the cold by the time I arrived at my desk for the rest of that winter. School days all over again. Now we have a DART and a Luas into town. JWT are no longer the giant of the Travel Business they once were. Aer Lingus have long since abandoned their staff mini bus. Bosses would be very reluctant to make remarks on a female colleague’s appearance – uniform or not. But we still insist on some women wearing skirts. I have never seen a female member of Aer Lingus or Ryanair cabin crew wear trousers; although I have seen some of the latter in bikinis. I should be thankful for small mercies I suppose. The fastest growing economy in Europe. New jobs being created every week. Cranes once again stalking the Dublin skyline. Even Dun Laoghaire, poster town of the recession, has an air of recovery about it with new shops opening regularly. Although many of us will be playing catch up for decades to come, as we try to replace savings and pensions that were decimated in the crash, until recently, I was relieved that the worst seemed to be over. Micheal Noonan said the emergency is over. I knew things weren’t perfect. I was aware of a homeless crisis but thought the government had it in hand with their plans for modular housing as an emergency solution. I thought we were doing alright, until I watched the recent RTE documentary “My Homeless Family”. Rarely has a programme made me so angry. Using their own voices and most poignantly the voices and the tears of their children, these brave women (and it was mainly women) clearly illustrated just who have paid the price for our recovery. Living in self-described ‘posh prisons or cages’ the pressure being exerted on these families every day is incredible and the documentary made for surprisingly hard viewing. I wondered why and then I realised it was because we were watching ourselves. These families are every family; just like us they battled to keep their kids amused, they supervised homework and celebrated birthdays in their collapsed tiny worlds. It could so easily have been any of us. Lone parent, Erica and her daughter Emily have a bond that is strong and familiar. I recognised it just I recognised Erica’s fear for the future as she tries her best to provide for her child. I was a lone parent for ten years and it was only a twist of fate that meant I had a supportive family with room for me and my daughter to live at home until I could afford to move out on my own. But I know Erica’s dreams. I dreamed them too. A house we could call our own; where she could have her own bedroom. Where she could have more space to play. Where she could invite her friends over after school. Erica’s pain although sharper was familiar. I was just lucky. But I could have easily been in her situation. The women who generously let us view their lives in an intimate way, instinctively understand that a secure, safe, place to call home is essential to children’s development and to family life. A home is not just a roof over one’s head and a bed to sleep in, it’s much more. The writer and essayist, Samuel Johnson said “to be happy at home is the ultimate result of all ambition, the end to which every enterprise and labour tends, and of which every desire prompts the prosecution”. How can these families achieve any of their ambitions living in such tiny spaces and with no security of tenure? Over the coming fortnight we will all be bombarded with how brilliant the Government were in rescuing this country and dragging us back from the brink of disaster. Yes, they did take control of the finances and restore some order to them. But the recovery belongs to the people, all of us who suffered cuts to our incomes and increases in our taxes. Austerity has been very brutal and almost all of us have paid a heavy price. But the highest price has been paid by those who are vulnerable; families on very low incomes or social welfare and lone parents. These people, families just like ours have been sacrificed in the name of this recovery. Families who now have nowhere to call home, through no fault of their own. The blame for this does not merely lie with the current government. For decades’ successive governments abandoned the policy of building social houses. Somewhere along the way our Governments went from running a country to merely running an economy. For many (not all) involved in politics it’s a game. It is a game created by men and still dominated by men, with a very male energy running through it and like any game it is all about winning. Keeping your seat at all costs. But politics is not a game. It is the art of caring for the people of the country. The women on My Homeless Family knew that. Having been stripped of that most basic right in life – a place to call home from which to build proper lives for themselves and their children, they are now doubly disadvantaged. If this republic means anything, it falls to the rest of us, to be their voice at the election. Homelessness must be front and centre of the next programme for government. Otherwise we are all complicit in their misery.